I’ve been enjoying Game of Thrones on HBO, but once upon a time, before the show premiered, I’d initially been interested in reading the novels. Recently I met someone who was holding off on watching the show until after she read the books, so we decided to start the first book in the series together. Luckily for me, it’s now been a few years since I watched the first season of GoT, and my memory of it is a bit fuzzy, so my experience with the book wasn’t entirely just a recreation of the show. That can often be a problem if you watch an adaptation first with a strong vision behind it, and it’s the reason I just read Gone Girl and am currently reading Inherent Vice— two novels with film adaptations coming out in the next few weeks/months where the books themselves are supposed to be very well-written and worthy of one’s time. While it’s true that sometimes reading a book first can lead to disappointment with an adaptation, watching an adaptation first can deprive you of ever being able to have your own experience with the source material… particularly if the adaptation is a strong one. 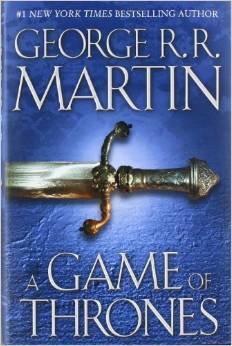 But there are some differences in the novel A Game of Thrones that helped me to set it apart somewhat from the series. Tyrion and Arya are physically described very differently from Peter Dinklage and Maisie Williams. Tyrion has blonde hair and mismatched, differently-colored eyes, and waddles when he walks significantly more than Dinklage as a result of somewhat misshapen legs. Arya is described as horse-faced and gangly-limbed, and made me think of a younger, pre-teen version of Sarah Jessica Parker or the girl who played Millie on Freaks and Geeks. And while I love both actors on the show, the differences in description helped me get away from them a bit to have my own experience with the characters. But there is much between the novel and show that is spot-on identical, and it’s a huge testament to the show that they were able to create so much of the world so faithfully and successfully. What really made reading the book after having seen the show worthwhile, however, was the sheer amount of information in the books. And while it’s not like I ever felt that I was getting a huge download of information about the various extended families in the form of blocky exposition, the fact of the matter is that there is a lot of information that just can’t be communicated within the show. George R.R. Martin does a really stellar job of working that information into the telling of the story, so that it feels smoothly communicated and doesn’t require huge pauses in the plot or storytelling, but it’s information that couldn’t be communicated in a visual medium without stopping everything to sit down and explain. The result was that, while reading the books, I understood the relationships between characters much more deeply. For instance, while watching Game of Thrones, I’m not sure I ever knew that Stephen Dillane, who plays Stannis Baratheon, was Robert’s brother. I was aware that he was in a different part of the world, slowly building his own army and political forces and collaborating with dark witch Melisandre (Carice van Houten), but the backstory and relationships, and consequently the motivations and possible consequences of his actions, were somewhat lost on me. Perhaps, in the back of my mind, I did know he was his brother on some level, but I certainly didn’t understand the nature of their relationship or the political nuances of what was happening. There’s also quite a bit about Robert Arryn, the previous Hand of the King killed prior to the beginning of the series, and his family’s subsequent retreat to the Ayrie, that was lost on me while watching the show. This was, I think, particularly true during the first season when I, as a viewer, wasn’t familiar with the world or its characters. I’d have to go back and rewatch that season to see if the information was there and it was just lost to me because I had nothing to attach it to, or if it simply was left unexplained and would automatically be lost to all viewrs. And while these particular details could have easily been made more clear with more exposition, it’s a constant throughout because of the enormous cast of characters and their intricate web of relationships with one another. If the show were to take the time to make everything clear, it would literally be an hour each episode of exposition. It’s some kind of writing miracle that Martin is able to so easily and succinctly communicate all of it in the novel, but he does– yet the written word is predisposed to the ability to do this in a way that visual media is not. Consequently I found my experience with the world of A Game of Thrones and its characters significantly opened and enriched. I’m assuming that at some point I will go back and rewatch the show from the beginning, and I’m certain I’ll get even more out of it now as a result of having read the books, as I plan to continue with the other novels in the A Song of Ice and Fire series. All of which is to say that I would definitely recommend the books to fans of the show, and rather than being a redundant experience, believe it will also complement and expand your involvement with the Game of Thrones universe as well. One area that I felt was handled much better in the novel was the character of Jon Snow. I don’t think Kit Harington is necessarily a bad actor, but he’s very one-note and certainly doesn’t have the kind of charisma that Jon Snow has in the books. There’s a decent amount of time spent with Snow in the first novel, and I felt much closer to the character and had a deeper understanding of him. That’s also true of the geography of the world and the way all of the storylines interconnect with each other. Often watching the show the different storylines feel like they’re happening in different, remote parts of the world. While that may be the case, Martin’s writing frames everything and places it in relationship with each other, so that you have both an understand of where everything is happening physically in relation to each other, and also how the various characters’ actions will immediately alter the delicate balance between everything. As for the writing itself, Martin is in top form with this series. The first book is a definite page-turner, no small feat with a page count of about 750. I’ve already mentioned Martin’s ability to communicate so much expositional information without it ever feeling like walls of text. And the characters are all complex and forever changing, which I think is probably the greatest hallmark of the series and the reason it’s been so successful in all of its forms. It’s not enough that Martin has crafted a compelling story (or web of stories), nor that he’s chosen a fantasy setting and richly illustrated the world; he’s also created an enormous, complicated cast of characters that are as fascinating and nuanced as you’d experience in contemporary fiction. Martin doesn’t simply create archetypes and then let them sit and do the work for him and occasionally play off of them, he’s forever developing and humanizing them and probing deeper into them. Yet all the while he still maintains a strong storyteller’s voice that allows his fiction to feel like it draws from a world fables and legends, and never becomes adrift or meandering or searching in its own telling. I’m never one to spoil plot, so I won’t reveal any story details here. And in this case, with the property so in the public consciousness, I don’t feel much of a need to summarize plot or even paint a picture of the world of the novels. It’s fantasy, both high and low but more low… and it’s some of the best writing being published today and perhaps the best fantasy to ever be published. Beyond that, what do you need to know? It’s about life and death, love and friendship, honor and responsibility, morality and faith, courage and fear, soul-searching and purpose. It’s about everything we experience, told through the prism of this fantasy world via compelling plots, sometimes with surprising twists, and very three-dimensional, human characters, whose strengths and weaknesses sometimes come from the same places. The language is full and prosaic but never dense and impenetrable, everything interwoven by a master of his craft. I do wonder if the book would have been even more effective for me if I hadn’t already seen the show and known what was coming. And in some ways, I was waiting to see how certain plot points or story progressions would work in written form. Martin never disappointed, and reading the book was always a pure joy, even when horrible or bleak things were happening. Yet I have to assume it would have been even more powerful if I didn’t know what was coming and wasn’t ostensibly waiting for it. I’m definitely looking forward to catching up to the show and hopefully eventually outpacing it, so that the last several books in the series will be my first experience with their content, and I can experience what that’s like with Martin’s writing. It’s so strong, it deserves it.